My Name is Bilal is a juvenile fiction book covering the story of Bilal and his sister Ayesha as they start at a new school. It does not take long for Bilal to realize they may be the only Muslim children in the school. His sister wears a headscarf, and Bilal notices that no one else is wearing one. When Ayesha is bullied by a couple of boys tugging her headscarf, Bilal freezes in shock and remains hidden. The next day, Ayesha is bullied again, and Bilal stands up for his sister. In the end, the bully and Bilal play basketball together and develop a sort of friendship. Bilal also discovers another student who shares his religious views as he realizes he and his sister are not the only Muslims at school. Bilal and Ayesha experience social injustice as they are bullied for their religious beliefs. Being the only Muslims in school, they are discriminated based on what they look like. Although My Name is Bilal hits hard on displaying the cruel nature of social injustice, it has an uplifting message as Bilal realizes he is not the only Muslim at school. Also, Bilal develops a friendship with one of the boys that was initially bullying him and his sister. 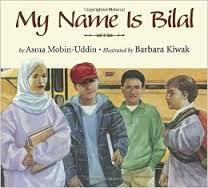 Teachers can use My Name is Bilal when discussing any number of historical social injustices. It can provide a modern-day, relatable avenue for children to connect with the social injustices of years past. This book could be read as a read-aloud before entering a unit about historical events such as Native American genocide, the Holocaust, crimes against persons with disabilities, etc.